Forward-thinking water industry leaders are putting enhanced risk management programs in place to assess their vulnerability, protect their systems, and proactively defend their water plant environments. The nature of security attacks is ever evolving and requires continuous vigilance to combat. 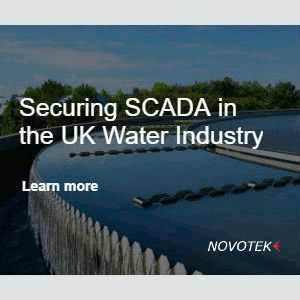 GE and their partners, Novotek, have been serving the water industry for decades and offers a comprehensive set of SCADA security solutions, built on experience and Predix, our platform for the Industrial Internet. Learn strategies recommended by U.S. Homeland Security and see how Novotek can provide strong defences which protect your SCADA network. Complete the form opposite to download the whitepaper. In order to receive this download free of charge I am happy to share my contact details with the download sponsor, Novotek. Novotek would like to keep you up to date with their products and services. Please tell us the different ways they can contact you.